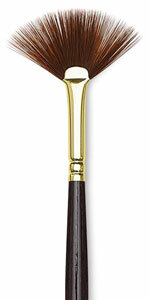 These strong, resilient brushes were specifically designed for use with acrylic paints. They are particularly matched to the Winsor & Newton Galeria Acrylic line. Their unique mix of synthetic filaments provides perfect control for thicker application of color while still retaining their shape. The long-handled styles are made from stiffer filaments, allowing thicker application on tougher surfaces.